I have one of the greatest jobs in the world. It is a job that allows me to help a variety of different people. Chiropractic is a safe and natural way to enable the body function at its optimal level. In life, no matter how careful we attempt to be, accidents and injuries happen. These accidents and injuries cause body imbalance allowing the spinal column to lock in a stressed position. This body imbalance affects the brain, the brain stem, the spinal cord and the nerves that make the body work. As a result, we experience pain, tension and stress. Dr. Neville is dedicated to restoring balance to the body. By restoring spinal balance, communication between your brain and body is open back up allowing your body to heal itself. 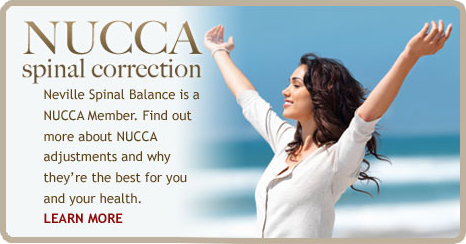 Call for a consultation with Dr. Neville to see what NUCCA can do for you.